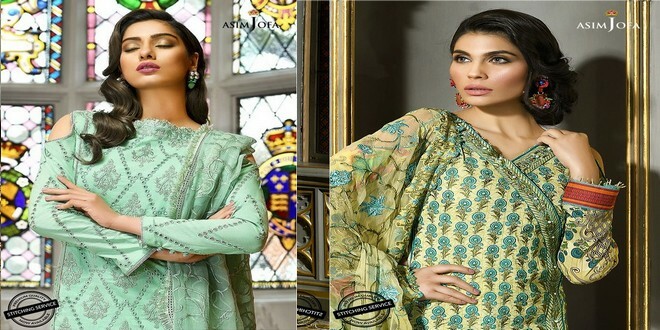 Asim Jofa Luxury Lawn Collection 2018 designer has maintained that good reputation by offering aesthetic designs year after year.The latest is Asim Jofa Lawn 2018 collection. It keeps the tradition of innovative designs yet looks refreshing and new. The faces showcasing these Lawn prints have changed. But the quality and aesthetic sense of the dresses has only improved. An unstitched Lawn suit from Asim Jofa’s 2018 range will cost you around PK Rs. 7,000. This may have sounded quite high just a couple of years ago. But now almost every designer offers Lawn suits in this price range. Despite a wide variety of designer lawn suits available, this collection will set you apart from the rest. Don’t get our word on it, see for yourself. The most affluential designer brand is bringing unique story of palettes, style and fashion with symbolic touch of individuality. It is presenting something hot and sizzling with outstanding creativity. AJL includes double anchor embroidery with tilla and sequence on net dupatta, embroidered borders on selvedge and double anchor embroidery jaal and 2 embroidered bunches given to enhance the design. This piece by Asim Jofa will make you stand out in a crowd. Stand apart from the crowd in this design detailed with double anchor and tilla embroidery. The outfit depicts masterful craftsmanship with dori and sequence embellishments. The embroidered chiffon dupatta also featuring anchor and tilla work, make this outfit a must-have. Fulfill the true essence of spring with this design that is a unique blend of shiffli embroidery and delicate tilla work. The white paste printed trousers add a subtle elegance to the outfit. For a perfectly coordinated look, the outfit is paired with an embroidered chiffon dupatta. This is one of the treats of April. Much loved and adored Asim Jofa Lawn 2018 collection is now finally available for purchase. Ever since it was introduced, Asim Jofa’s summer offering has become one of the best collections. Every year, the designer introduces range of new suits that make all of us fall in love with new designs again.